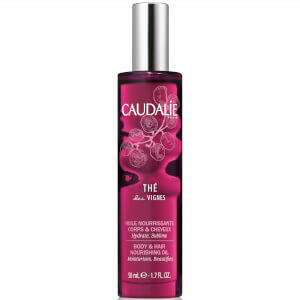 Feel perfectly pampered from top to toe with Caudalie Thé des Vignes Nourishing Body Lotion; a lightweight, quick-absorbing formula with a delicate fragrance of Neroli, Musk, Jasmine and Ginger. Fortified with antioxidant-rich Grape Seed, the luxurious lotion moisturises and hydrates skin, whilst defending against dryness and leaving the body feeling velvety soft, supple and comfortable without greasy residue. Housed in a pump bottle for mess-free application. Apply morning and evening in a circular motion, paying particular attention to dry areas. Aqua/Water/Eau, Glycerin*, Caprylic/Capric Triglyceride*, Vitis Vinifera (Grape) Seed Oil*, Butylene Glycol*, C14-22 Alcohols*, Sesamum Indicum (Sesame) Seed Oil*, Potassium Cetyl Phosphate, Parfum (Fragrance), Stearic Acid*, Palmitic Acid*, C12-20 Alkyl Glucoside*, Dimethicone, Sodium Acrylates Copolymer, Caprylyl Glycol, Hydrogenated Polyisobutene, Sodium Pca*, Cetyl Alcohol*, Potassium Sorbate, Helianthus Annuus (Sunflower) Seed Oil*, Borago Officinalis Seed Oil*, Palmitoyl Grape Seed Extract*, Phospholipids*, Polyglyceryl-10 Stearate*, Tocopherol*, Ginkgo Biloba Leaf Extract*, Sodium Hydroxide, Sodium Hyaluronate, Limonene, Linalool.